The CCWAS IGERT accepted our final cohort for the 2015-2016 academic year. If you're interested in research at the interface of climate change, water, and societal effects, we encourage you to contact the faculty members in our program. They might have other sources of funding available. Email our coordinator, Carole Hom, if you would like guidance on faculty contacts or potential graduate programs. Prospective doctoral students interested in pursuing multidisciplinary research on climate change and its impacts on water and society may be supported by CCWAS IGERT traineeships. Students admitted to the CCWAS IGERT will receive stipends of $30,000 per year for two years, plus fee waivers. We designed the CCWAS IGERT program to help launch doctoral students into dissertation research that involves some aspect of the intersection of climate change, water, and policy. Thus, in most disciplines, prospective students should plan to begin a doctoral program the same fall that they enter CCWAS and therefore should apply concurrently. The exception: because of the demanding first-year curriculum in Agricultural and Resource Economics (ARE), we prefer to admit ARE students in the summer after their first year. 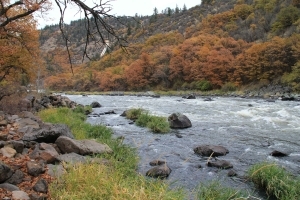 Klamath River in autumn, courtesy of Alison Oliver/UC Davis. To apply for admission to the CCWAS IGERT 2015-2016 cohort, please do the following. email academic coordinator Carole Hom (clhom at ucdavis dot edu) to let her know of your interest (recommended). 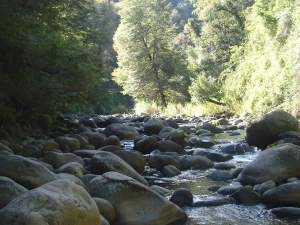 A pristine reach of the Trilaleo River, near Chillan, Chile. Photo courtesy of Diego Rivera/U. of Concepción. Please have a prospective advisor willing to endorse your full participation in the CCWAS IGERT. Advisors need not be CCWAS trainers but they must understand and support the goals of the CCWAS program. We strongly encourage you to contact faculty who might serve as your advisor well in advance of the application deadline of your prospective doctoral program. You must apply to an appropriate doctoral program at UC Davis. The CCWAS IGERT does not grant degrees so applying only to the CCWAS IGERT does not admit you to a graduate program. Check with your prospective graduate program to find its deadline. Some UC Davis graduate programs have early December application deadlines; some use 15 January. Download the CCWAS_application cover page from our website. Write the specified statement of purpose, attach a CV, and send the cover page, statement of purpose, and CV (via e-mail or snail mail) to the address indicated at the bottom of the cover page. email academic coordinator Carole Hom (clhom at ucdavis dot edu) to let her know of your interest. The CCWAS IGERT does not have a hard deadline for applications; however, for full consideration, please apply by mid-January. We regret that, because of NSF requirements, only US citizens and permanent residents are eligible for funding in the CCWAS IGERT. Do you have a two-body problem? Please let Carole know. We may be able to help you brainstorm a set of potential solutions. Questions? Contact our academic coordinator, Carole Hom, at clhom at ucdavis dot edu.